My husband has been complaining that recently I never bake him any cakes to eat; so after deciding to make a lemon drizzle cake for work I thought I would surprise him with one of his favourites… Chocolate muffins. He has said that muffins are for men and the cupcakes for the ladies and I can kind of see his reasoning as muffins are heavy and usually undecorated and cupcakes are light, fluffy and beautifully decorated but as yet I haven’t found anyone to turn a cake down solely due to their gender! I have been making this chocolate muffin recipe for a while now as it is so easy and simple to do and (as far as I can tell) impossible to get wrong. When making muffins, don’t be scared if the mix looks a little lumpy and isn’t smooth as a normal cake mix because this is completely fine. Try not to over work the mix as it will make the muffins a bit heavier, just mix enough till all of the ingredients combine – no need to beat the mixture for a while as they will still rise perfectly. As they are triple chocolate muffins you need to use two different types of chocolate chips in it, usually it’s milk and white but sometimes it is dark and milk chocolate, whatever is your preference. This time I decided to cut up half a small bar of dark chocolate to put into the mix, as I know it’s my husbands favourite type of chocolate and used milk chocolate chips. 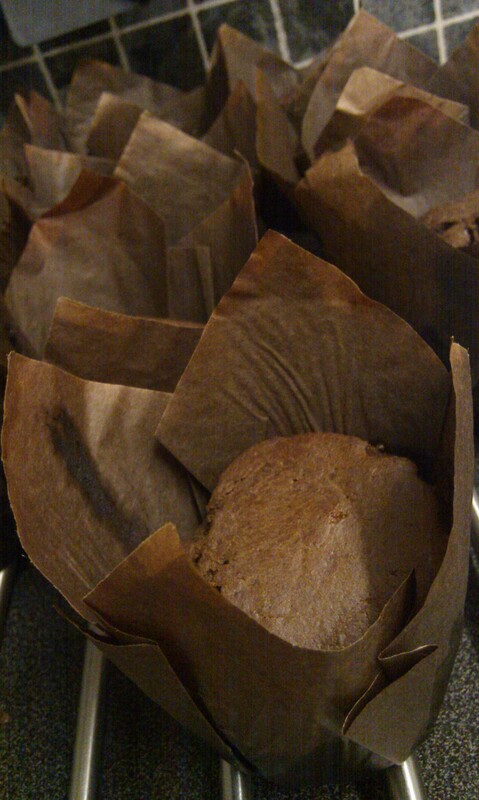 For muffins, I like to use tulip wrappers as they give them quite a professional look. You can buy these from most shops now or eBay but I believe it is just as easy to make them yourself from a square of parchment paper pushed down into a muffin tray. Try and fill them up about 2/3rds. It is fine if they spill over the top when cooking as I think it is better to have really big muffins than small dainty ones. When I was in Australia on holiday last year I was very impressed with the cakes they had there, especially the muffins – they were HUGE! I decided from then onwards that if I ever get to open my cake shop then the muffins will be just like the ones I had there. This recipe makes 6 gigantic, 8 big, 10 good size or 12 small muffins – I usually make 10. In a bowl put all of your dry ingredients, these are flour, cocoa powder, sugar and baking powder. In a separate bowl measure your milk and beat into the milk the two eggs. Mix the wet ingredients into the dry and stir till they just come together to make a sticky mix then stir in the chopped chocolate and chocolate chips. Remember at this stage not to overwork the mix. Bake in the oven till a skewer comes out clean.